My views on various ideas, theories, issues, news of interest. Contrary opinions welcomed (but nicely). Thank you, Sam. 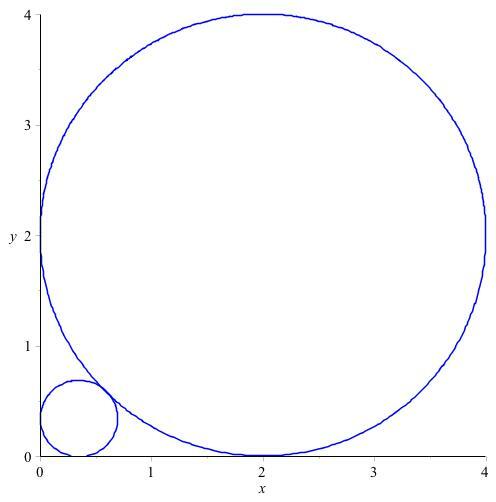 In the diagram shown we have part of a circle of radius whose center is at the point and which is tangent to the x and y axes — though the graph is drawn for R = 2, we want to work with general R.
Our focus is on the region under the circle above the x-axis. The question is: what is the maximum area that a triangle inside this region can have? It may occur to you that there is a reasonable `quick’ answer, but the point of the problem is to reason it out carefully so you more or less have a proof that you do indeed get a maximum area. Since the region is concave, the vertices of a triangle cannot be so that one is too close to the far right while another vertex close to the far top left (or else the triangle would not be fully inside the region). You can easily see that we can repeat the process by looking at the southwestern circles for ever and ever because there will always be a gap, and you get smaller and smaller circles with small radii. What if you add up all their radii? Do they add up? 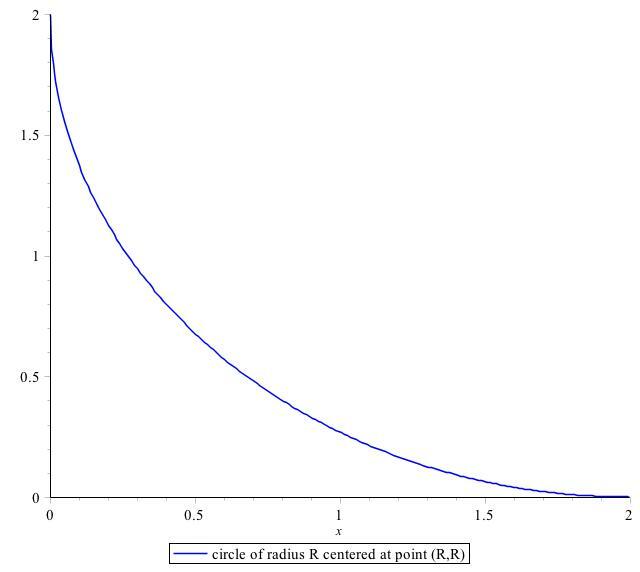 If so to what number do they add up, in terms of the original radius R. If they don’t add up, why don’t they? The Cosmic Microwave Background (CMB) radiation is a very faint but observable form of radiation that is coming to us (and to other places too) from all directions. (By ‘radiation’ here is meant photons of light, or electromagnetic waves, from a wide range of possible frequencies or energies.) In today’s standard model of cosmology, this radiation is believed to emanate from about a time 200,000 to 400,000 years after the Big Bang – a timeframe known as ‘last scattering’ because that was when superheavy collisions between photons of light and other particles (electrons, protons, neutrons, etc) eased off to a degree that photons can ‘escape’ into the expanding space. At the time of last scattering, this radiation was very hot, around K (in the Kelvin scale). And in time, as space expanded, radiation cooled to its currently observed value of K.
In this formula, is the frequency variable (a positive real number that gives the number of cycles per second of a wave) and is the energy density as a function of frequency . The other variables are: is the temperature of the black body which is assumed to be in equilibrium (so the temperature is uniformly constant throughout the body of radiation), is the speed of light in vacuum, is Planck’s constant, and is Boltzmann’s constant from statistical mechanics. 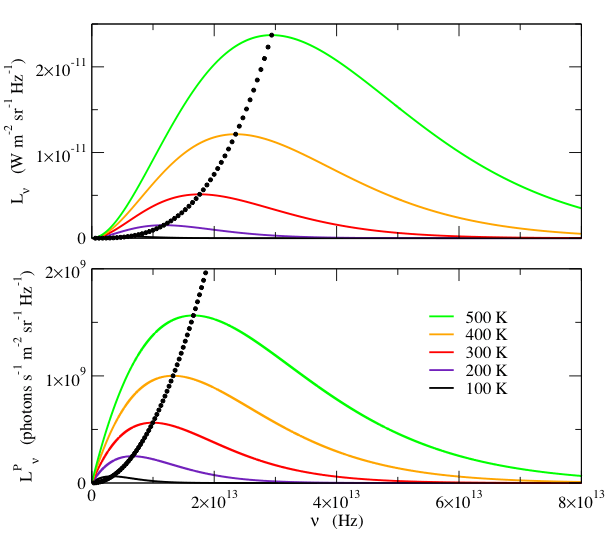 Various Planck radiation density graphs depending on temperature T.
You’ll notice that the graphs have a maximum peak point. And that the lower the temperature, the smaller the frequency where the maximum occurs. Well, that’s what happened as the CMB radiation cooled from a long time ago till today: as the temperature T cooled (decreased) so did the frequency where the peak occurs. The is the frequency that gives maximum density and as you can see it is a straight linear function of temperature. The greater the temperature, the proportionately greater the max frequency. The colder the temperature gets the smaller the max-frequency gets, and from Planck’s energy equation , so also does the energy of the radiation drop. Far back in time, when photons were released from their collision `trap’ (and the temperature of the radiation was much hotter) this max frequency was not in the microwave band. Anyway, I thought working these out was fun. where c is the speed of light (in vacuum). And that’s the end of our little story for today! Suppose you have a list of n numbers . which is read “sum of from k=1 to k=n.” This letter k that varies from 1 to n is called an ‘index’. In his theory’s notation, it’s understood that the index k here would vary from 1 to 4, for the four dimensional space he was working with. That’s Einstein’s index notation where 1, 2, 3, are the indices for space coordinates (i.e., ), and k=4 for time (e.g., ). One could also write space-time coordinates using the vector where t is for time. The most important tensor in Relativity Theory is what is called the metric tensor written . It describes the distance structure (metric = distance) on a curved space-time. So much of the rest of the geometry of space, like its curvature, how to differentiate vector fields, curved motion of light and particles, shortest path in curved space between two points, etc, comes from this metric tensor . You could have a tensors with 3, 4 or more indices, and the indices could be mixed subscripts and superscripts, like for example and . Here is a short, sweet, and quick summary of some of Albert Einstein’s philosophy and religious views which I thought were interesting enough to jot down while I have that material fresh in mind. (I thought it’s good to read all these various views of Einstein’s in one fell swoop to get a good mental image of his views.) These can be found in most biographies on Einstein, but I included references  and  below for definiteness. (Throughout this note, ‘he’ refers, of course, to Einstein.) Let’s begin! Einstein began to appreciate and identify more with his Jewish heritage in later life (as he approached 50). God had no choice but to create the universe in the way He did. He believed in something larger than himself, in a greater mind. He called nationalism an infantile disease. He believed Jesus was a real historical figure and that Jesus’ personality pulsates in every word in the Gospels. He did not like atheists quoting him in support of atheism. He believed in an impersonal God, who is not concerned with human action. His belief in an impersonal God was not disingenuous in order to cover up an underlying ‘atheism’. He was neither theist nor atheist. He liked Baruch Spinoza’s treatment of the soul and body as one. He did not believe in immortality. He believed that the imagination was more important than knowledge. He believed in a superior mind that reveals itself in world of experience, which he says represents his conception of God. Albert Einstein, Ideas and Opinions. Albert Einstein’s views on religion and on the nature and existence of God has always generated interest, and they continue to. In this short note I point out that he expressed different views on whether he subscribed to “pantheism.” It is well-known that he said, for instance, that he does not believe in a personal God that one prays to, and that he rather believes in “Spinoza’s God” (in some “pantheistic” form). Here are two passages from Albert Einstein where he expressed contrary views on whether he is a “pantheist”. It is true that Einsteins expressed his views on religion and God in various ways, but I thought that the fact that he appeared to identify and not identify with “pantheism” at various stages of his life is interesting. Setting aside that label, however, I think that his general conceptions of God in both these quotes — the mysterious order in the books, a universe already written in given languages, a superior mind that reveals itself in such ways — are fairly consistent, and also consistent with other sentiments he expressed elsewhere. Here’s an image of something I wrote down, took a photo of, and posted here for you. It’s a little game you can play with any irrational number. I took as an example. You just learned about an important math concept/process called continued fraction expansions. With it, you can get very precise rational number approximations for any irrational number to whatever degree of error tolerance you wish. You can do the same thing for other irrational numbers like the square root of 2 or 3. You get their own sequences of whole numbers. (so it starts with 1 and then the pair “1, 2” repeat periodically forever).